With this utility you can save your selected range or chart as a picture in GIF-, PNG-, JPG-, TIF or EMF-format. GIF: Recommended when your selection or chart has only a few different colors. Perfect for publications on the internet. JPG: Recommended when your selection of chart has a lot of different colors (as in a photo). Perfect for publications on the internet. PNG: Better quality then JPG, but not yet supported by all software (email). Works in all recent internet browsers. TIF: Best quality for photo quality color images. Usually also the largest file size. Not available in Excel 2003 and later, in that case, please use PNG instead. EMF: A vector graphic in EMF (enhanced version of WMF) format can be scaled and fully edited in MS Office and other Windows applications. When you export a large range or a large chart a part of the exported image might be truncated or colors might be lost. 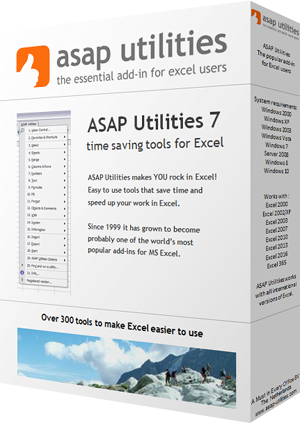 This is not an ASAP Utilities bug, Excel has a limit on the size of the exported images. This limit depends on your Windows and Excel version (Microsoft KB185001: http://support.microsoft.com/kb/185001/en-us). Starting from Excel XP/2002 in combination with Windows XP much larger images can be produced. In some cases when your image gets truncated exporting your image as EMF file might be a solution. Another solution is to copy the chart or range and paste the result in your favorite image-editing program or MS Office application. You can do this by using by copying in a special way in Excel. In Excel 2000, 2002/XP and 2003 hold down the shift-key and then in the menu choose "Edit" and then "Copy Picture". Another option to place the selection as a picture on your clipboard is to use the tools in the ASAP Utilities export submenu. Graphs, Charts, save, jpeg, image, website, blog, Graphics Interchange Format (.gif), JPEG File Interchange Format (.jpg), Portable Network Graphics Format (.png).